Welcome! Every Sacred Sunday is a Mass journal and community dedicated to Christ. We believe the Mass matters. We strive to spread the Gospel. We come to community as we are with open arms. How do you prepare for the most important hour of the week? Every Sacred Sunday contains the full Mass readings for each Sunday and Solemnity in the upcoming liturgical year (December 2, 2018 through November 24, 2019). With thick paper and a clean, crisp layout, each page is ready for underlining, highlighting, and note taking. Beauty draws us towards God. With gold foil stamped cover, durable binding, thick matte pages, and original watercolor illustrations for each liturgical season, Every Sacred Sunday is specifically designed to be both functional and beautiful. The joy of Every Sacred Sunday is sharing it with you. We created Every Sacred Sunday in 2017 because we realized it was a product we both wanted in our own lives. 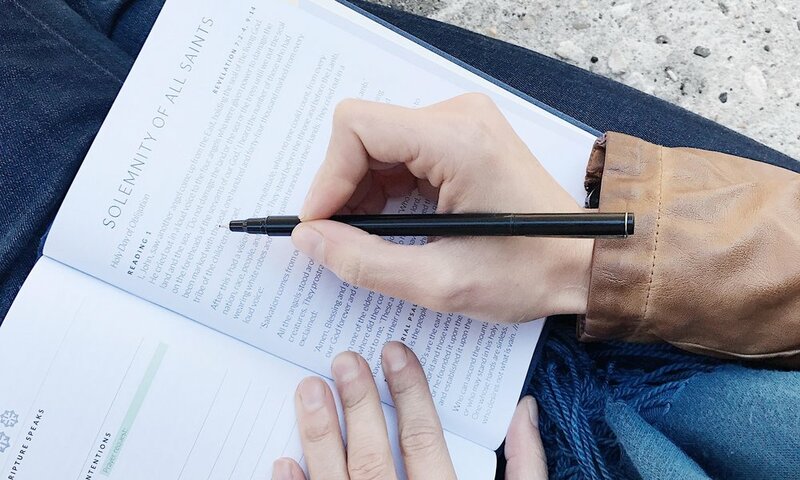 Seeing this journal used at churches across the US (with purchases in all 50 states!) made us realize that God dreams much bigger than we had ever dared. We’re honored to bring this second publication of Every Sacred Sunday for the 2018-2019 liturgical year. We hope this book helps you say yes to God, one Sunday at a time.